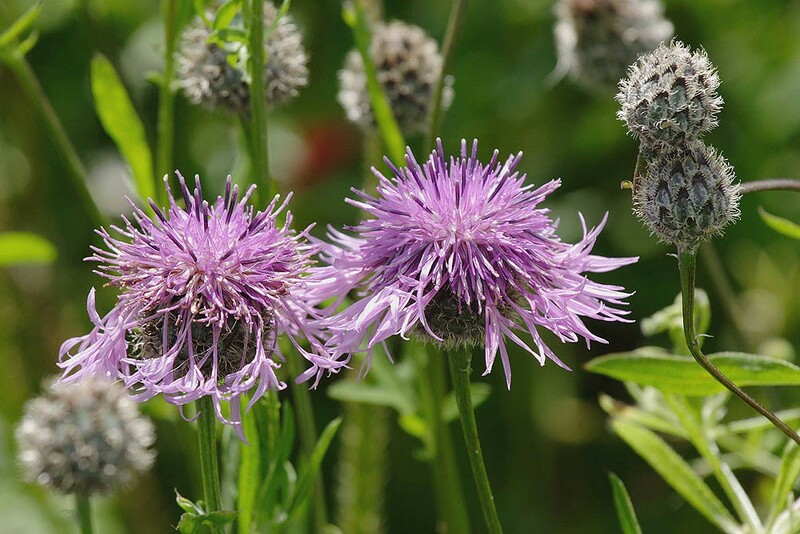 With its large, purple, thistle like flower heads Greater knapweed looks a little like the rayed form of Common knapweed but with larger flower heads and different habitat requirements (for more information check out the Common knapweed page). Flowering occurs from July to September. Greater knapweed is a medium to tall native perennial found on a variety of grasslands on dry, calcareous soils. It is usually absent from intensely managed meadows and pastures and is most often associated with taller swards but can occasionally be found in scrub land, woodland edges, road verges and waste ground. In common with many members of the daisy family greater knapweed is an important food source for a wide range of insects including bees and butterflies. The marbled white butterfly (Melanargia galathea) seems to be particularly attracted to it sometimes festooning the flower heads in large numbers.